Park at the Cravens House on the side of Lookout Mountain, as tourists, hikers, and trail runners do every day of the year, and it’s easy to be swallowed up by the history of the place. Monuments tower across a grass lawn while others stand like silent ghosts, commemorating men who fought, yelled, and bled into this ground during the Civil War. On an overcast day in May, my friend Jerry Patton and I set off from the Cravens House, going left from the upper parking lot onto the East Cravens Trail, past the huge boulders in the yard of the Hardy House, a historic slate-roofed cottage dating back to the 1920s. Like most of the hiking trails in the park, East Cravens was built by the Civilian Conservation Corps during the Great Depression, but the route was later abandoned and almost forgotten. I will never forget the day in 1990 when I was out alone traversing the slopes and stumbled across the huge, magnificent stonework of Lookout’s first incline railway, built over a century earlier. At the time, the trail was completely overgrown, the path so faded into the woods that I felt like I might be the first person in decades to see the remains of some fantastic, ancient experiment in engineering. 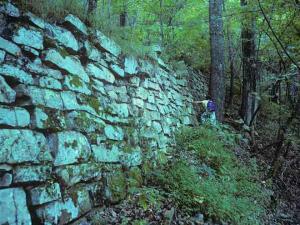 How did this remarkably steep and well preserved roadway come to be? As it turned out, this Incline was built for a woman—not to please her, but to spite her. During the War of the Mountain Roads, the center of the storm swirled around a beautiful, intelligent, and somewhat quarrelsome music teacher named Harriet Whiteside. 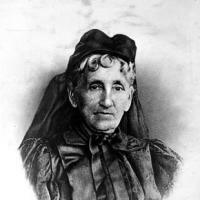 In 1843, a talented young woman named Harriet Lenora Straw came to Chattanooga to teach piano to the daughter of Col. James Whiteside, an attorney, politician, and railroad enthusiast who owned much of the north end of Lookout. Just 20 years old at the time, Harriet soon married Col. Whiteside, who had been widowed ten months earlier. When James Whiteside died in 1861, Harriet was one of the richest women in Tennessee. A key part of the estate was the Whiteside Turnpike, the first and, for many years, only public road up Lookout Mountain. 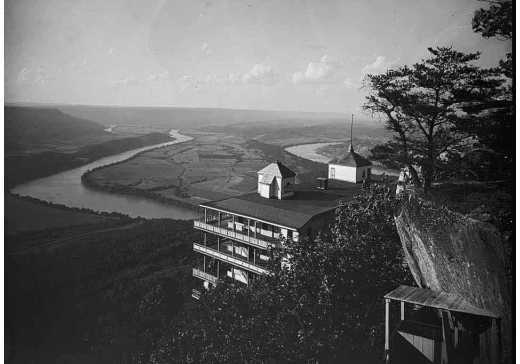 The view of Moccasin Bend from the point of the mountain (now Point Park) was already a popular attraction. As tourism and later the yellow fever epidemic of 1878 swelled, traffic on the old mountain road, complaints that Harriet Whiteside was too greedy with the tolls, and not spending enough to maintain the road grew louder. Lawsuits multiplied, feeding on one another. Harriet Whiteside had by now remarried, this time to an attorney named Varney Gaskill, who could conveniently represent her at no cost. However, Harriet did not like to be disappointed. When Gaskin was unable to prevail in court often enough, she forced him to pay rent to live in his own house. In 1885, the Incline #1 was constructed from St. Elmo up to the bluff line at the Point. In design, it was similar to Lookout’s current Incline Railroad, with two cars that balanced each other, one climbing while the other descended. 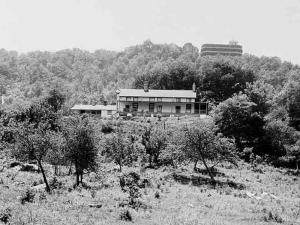 At the top of Incline, directly adjacent to the bluffs and her property line, Whiteside’s rivals constructed an imposing, modernistic hotel with wrap-around balconies. The top floor was nearly even with the top of the Point so that guests could enjoy the same view without setting foot on the Whiteside property. The Incline car berthed in the lower level of the hotel; on the opposite side was a station for a narrow gauge railroad that ran along what is now the Bluff Trail to Sunset Rock and beyond. The imposing, ugly hotel and the railway were only in business for about 10 years. 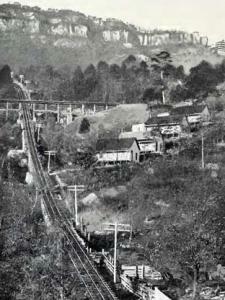 A second Incline Railway, still in operation today, was constructed in 1895. Although the two competed for a time (an ad for Incline #1 warned of the “intense and bitter disappointment” would that result if passengers took the other route), the new railway boasted a steeper grade and more spectacular views. The new Incline flourished and bought out the old. The rails were taken up, the Point Hotel was torn down, and nature began quietly to reclaim the site.